Welcome to India, You will be received by our "Times India Travels" representative or your driver at international airport and assisted to your hotel. In the Hotel the representative / driver will hand over your documents regarding the tour. After enjoying the hearty breakfast, leave for the sightseeing tour of Old & New Delhi. Including Jama Masjid - one of Asia's largest mosques, Red Fort- the magnificent and most opulent fort built during the years 1638 -1648 by the Moghul Empire, walk through the silver street of Chandni Chowk, Raj Ghat - the cremation site of Mahatma Gandhi, A massive temple - Akshar Dham, The Hindu temple -Birla Mandir, The Humayun’s Tomb & Qutab Minar - a 73 m high victory tower and The Bahai Temple - shaped like a lotus flower and a proof of India's secularism. The India Gate - war memorial, The Rashtrapati Bhawan - President's House, Parliament House and Government Secretariat Buildings. Overnight stay at New Delhi hotel. After breakfast at the hotel drive to Mandawa upon arrival check-in hotel and later we leave to see Mandawa - often called the “open air art gallery of Rajasthan’ the region is famous for the high quality frescoes. See the beautifully painted havelis on the ancient and the famous silk route built in the 18th and 19th centuary by the rich merchants. Later take a heritage walk in this beautiful village. You can also see the traditional lifestyle of the local people. Overnight stay at Mandawa hotel. After breakfast, drive to Bikaner. On the way visit Fatehpur Village which is also famous for the splendid havelis of the Shekhawati region. Reach Bikaner by afternoon later set of for the sight seen tour of Bikaner includes visiting the impregnable 15th century Junagarh Fort reputed to have remained unconquered till date,the fort has a number of gates- Karan Pol (gate) provides access to the fort, next to it is Suraj Pol (sun gate Also visit the Camel Breeding Farm which carries out breeding and training of camels (closed on Sundays). Evening time is to visit Deshnoke Rat Temple. Overnight stay at Bikaner hotel. After having breakfast, leave through the Thar Desert for Jaisalmer, en-route visit Pokharan -- the birth place of Akbar the Great (3rd Mughal Empror). Visiting the local market in the heart of the village and after taking lunch we proceed towards Jaisalmer. Arrive there by early evening. Let the Sun set view of this desert city weaves magic on you, leaving you speechless and mesmerized. Overnight stay at Jaisalmer hotel. 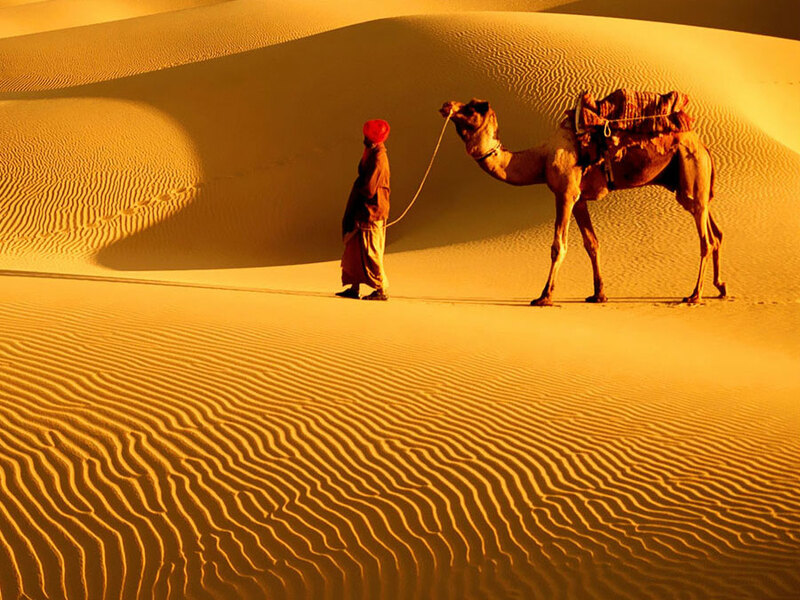 Sightseeing tour of the Golden City – Jaisalmer, includes Sonar Fort or the Golden fort, rises from the sand and merges with the golden hues of the desert ambience. Badal Niwas, Manak Chowk, Patwon Ki Haveli -- one of the largest and most extensively carved Haveli with remnants of mirror work and paintings on the walls, Nathmal Ji Ki Haveli known for its unique miniature style paintings and mighty tuskers carved out of yellow sandstone stand guard to the haveli & Deewan Salim Singh Ki Haveli -- Prime Minister’s residence of 18th century. Visit the Gadisar lake then in evening camel carts safari for sunset onto Sam or Khuri Sand Dunes where you can enjoy dinner in mud huts listen to the folk tunes by the local artists and musicians. Overnight stay at Jaisalmer hotel. Early Morning depart to Jodhpur, en-route visit Mandore Gardens. Check into hotel. 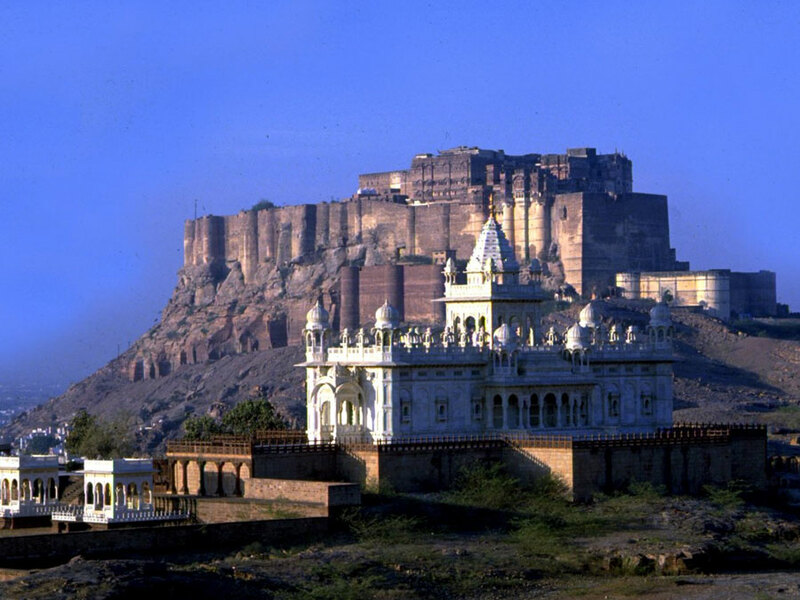 Post lunch seightseeing tour includes Mehrangarh Fort - pride of Jodhpur, still stand high witnessing the battles fought. 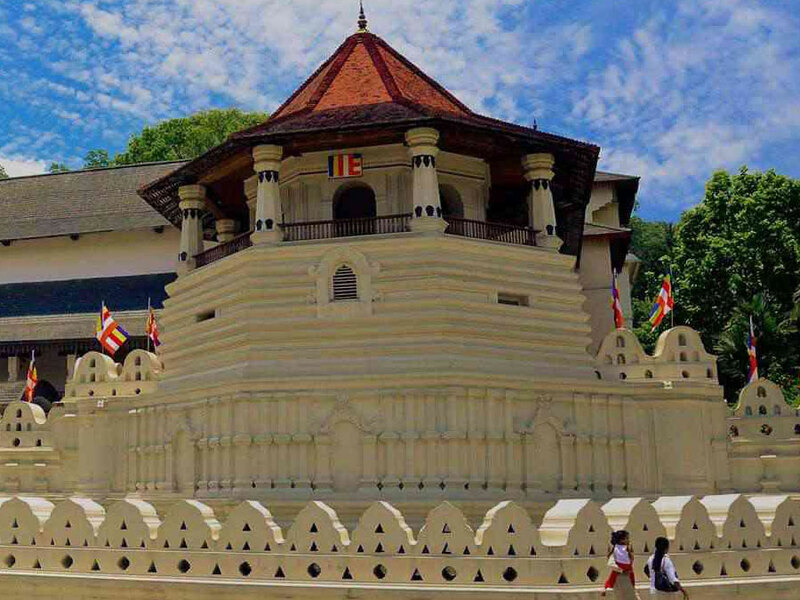 Museum inside the fort displays a rich collection of old royal palanquins, arms, paintings, costumes, etc. 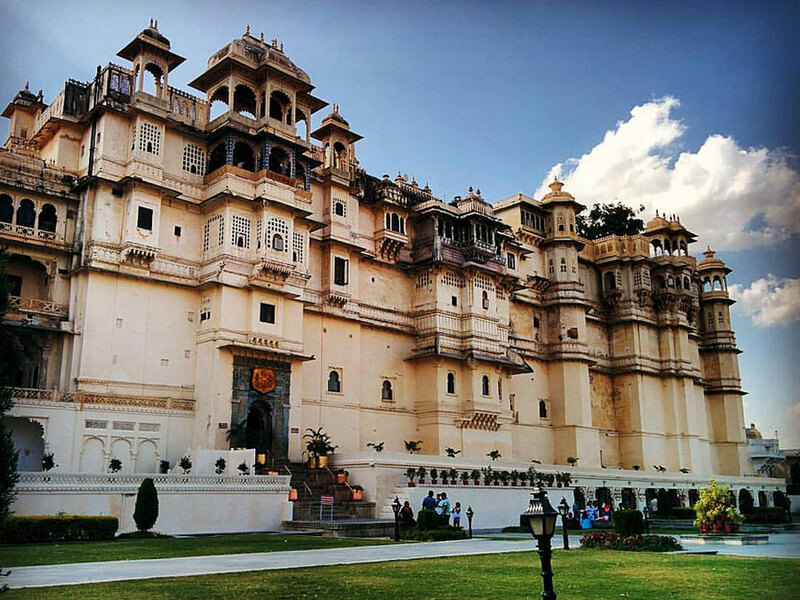 Fort has number of palaces - Moti Mahal, Phool Mahal, Sheesh Mahal, Takht Vilas and Jhanki Mahal. On the way down from the fort, towards left is Jaswant Thada -- intricately carved marble stone temple shaped cenotaph of Maharaja Jaswant Singh II. Umaid Bhawan Palace or Chittar Palace -- palace with no mortar bindings, only chiselled sandstone blocks are interlocked together. Evening is leisure or you can walk along the famous spice market and feel the flavours of indian spices. Overnight stay at Jodhpur hotel. After breakfast, drive to Udaipur enroute visit Ranakpur, the city named after Rana Kumbha, known for its Jain temple. The four images of Adinath are enshrined in the main temple called 'Chamukh', having 29 halls and 1444 columns all with differently carved sculpturs. The complex also includes Sun Temple, Amba Mata Temple, Parsvanath and Neminath temples. Overnight stay at hotel. Later Kumbhalgarh Fort – One of the few impregnated forts in Rajasthan, with 2nd longest wall after china around Kumbhalgarh, the Muchchal Mahavir temple is wisely popular. 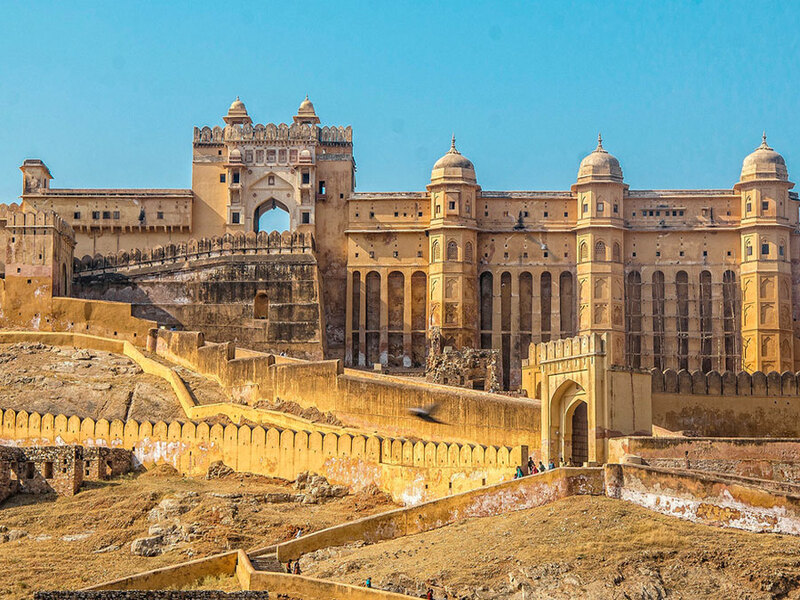 This fort stands on a rocky hill commanding an excellent view of the wild and rugged scenery of the Aravallis and the sandy desert of Marwar. Reach Udaipur in afternoon and check in hotel. Later, see the Sahelion ki Bari where Maharana Sangram Singh build this garden complex with fountains and lakes for his beautiful daughter. After that move around the narrow streets of Udaipur. Overnight stay at Udaipur hotel. After breakfast move out for the city tour of Udaipur visit the City Palace -- a grand palace with beautiful architecture, the Jagdish Temple -- dedicated to Lord Vishnu, and the folk art museum with a colorful collection of puppets, musical instruments and paintings.In the evening you can wander through the city or take an boat ride on Lake Pichola and see the fabulous lake palaces of Udaipur, the Jag Mandir Palace and the Jag Niwas Palace now known as the Taj Lake Palace, where you can enjoy your dinner in a regal ambience. Overnight stay at Udaipur hotel. Leave Udaipur and head towards Pushkar on the way visit the Eklingji and Nagda Jain Temple. Also visit the Saas and Bahu Temple dedicated to Lord Shiva and Vishnu. Afternoon reach the Holy City - Pushkar, the place where Lord Brahma (Creator of the Hindu Trinity) and Savitri (His Wife) perform “Yagnas”. Here we visit Brahama Temple and Lake Pushkar, where devotees take holy bath in lake water. The legand says that the lake sprout on the place where the lotus petals fell on earth from the hands of Lord Brahma. 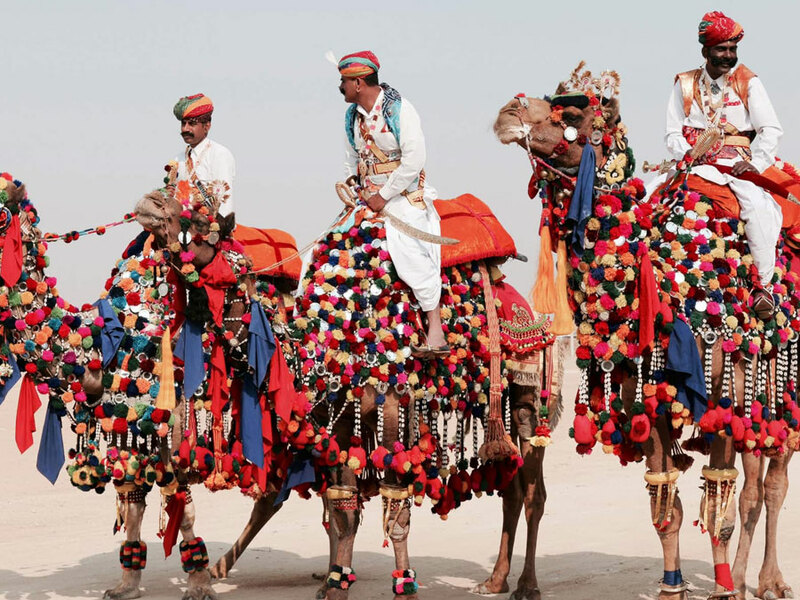 Pushkar is popular for the Pushkar Fair or Camel Fair that held every year in the month of November. In evening enjoy the walk along the colourful and bustling local market.Overnight stay at Pushkar hotel. On the way to Jaipur in Ajmer visit Nasiya Golden Jain Temple, “Dargah Sharif” and Adhai Din Ka Jhopra. After that welcome to The Capital city of Rajasthan which is also known as “Pink City” This afternoon, set off to see the City Palace -- still the home of the former royalty H.H Bhawani Singh Ji of Jaipur housing an extensive collection of art, carpets and old weapons. Jantar Mantar Observatory -- situated in the heart of the city where time has been accurately measured since the 17th century the largest and best preserved stone observatory,on the way back visit Birla Temple. Overnight stay at Jaipur hotel. 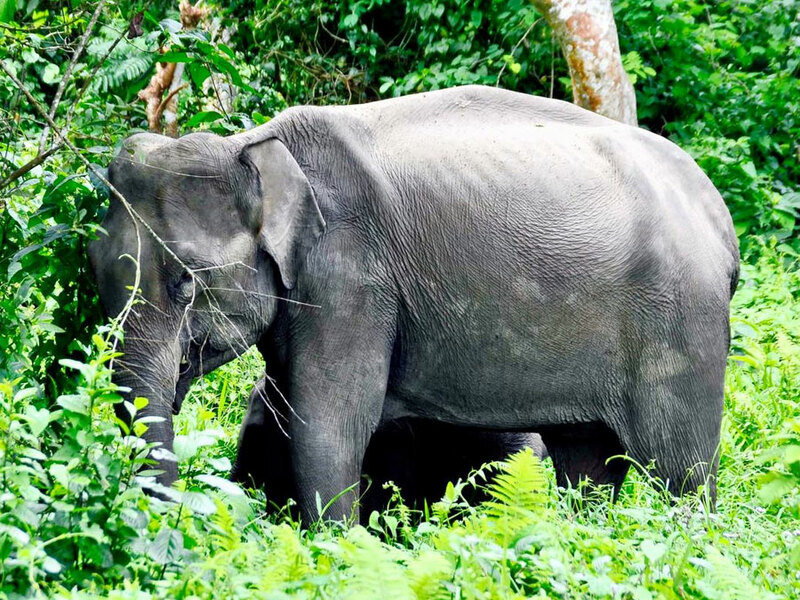 A full day sightseeing stopping to view the dramatic hilltop fortress at Amber - ascend the imposing fort on a painted elephant. We wander among glittering inlays and the Hall of Mirrors ‘Sheesh Mahal’. Within the palace are Diwan-e-Aam the "Hall of Public Audience", Diwan-e-Khas the "Hall of Private Audience" and the Sukh Niws where a cool breeze blows, the Jai Mandir or the "Temple of Victory". Enroute visit Jal Mahal the“Water Palace” built in centre of Maota Lake which was a resting place of the kings. Hawa Mahal -- The Palace of Winds, the facade of which is all pink windows and filigree screens. After Lunch visit “Monkey Temple”, Galta Sun Temple -- beautiful place sorrounded by mountains. Enjoy a Bollywood movie at “Rajmandir” the Second best Cinema in Asia. 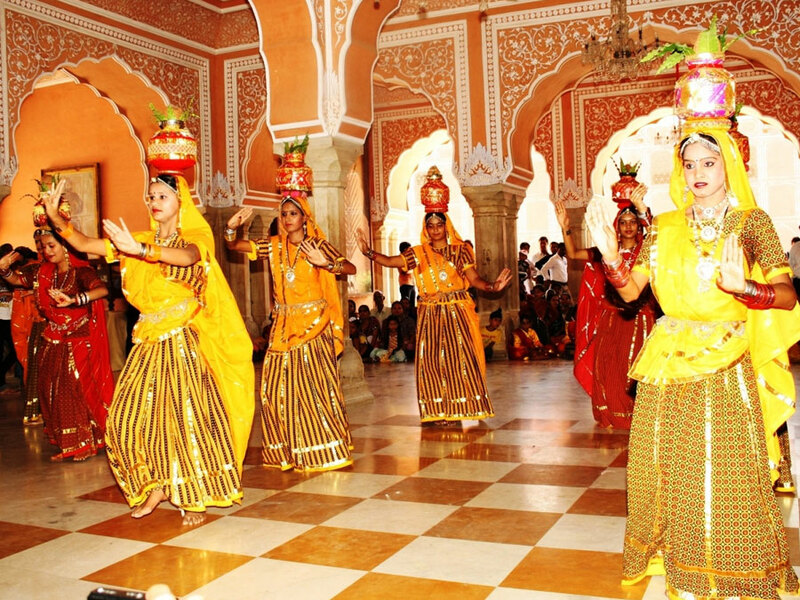 In the evening then enjoy dinner with folk dances and music by typical Rajasthani women in an Indian Restaurant. 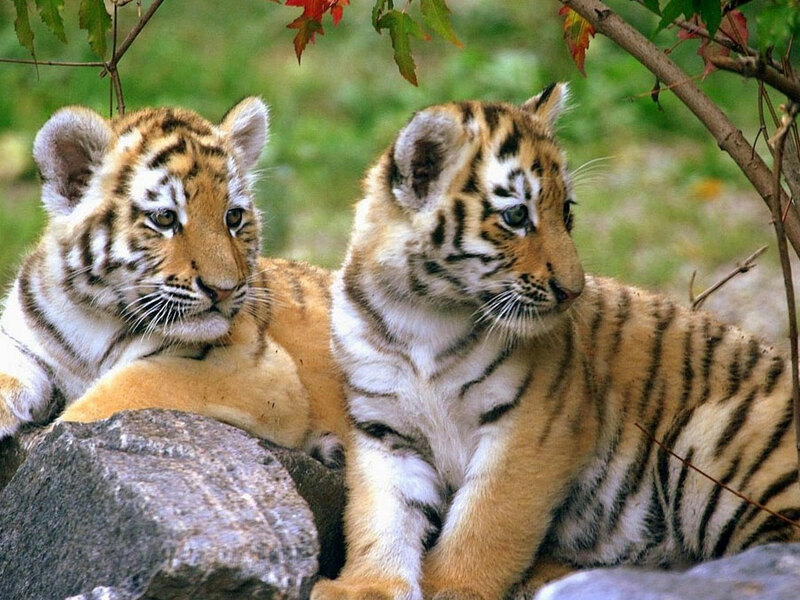 After a morning at leisure we drive to the city of Taj, Agra, stopping enroute at ornithological reserve at Bharatpur – Keoladeo National Park. Post lunch tour of the Phantom city Fatehpur Sikri built by Akbar in the late 16th century, it was abandoned after only 14 years due to shortage of water. The entire city of Red sand stone (sand stone palaces and temples) is virtually intact and a site worth seeing is 54 m high main entrance. Jami Mosque, Buland Darwaza, Tomb of Shaikh Salim Chishti, Jodha Bai and Birbal's house are the other attractions. 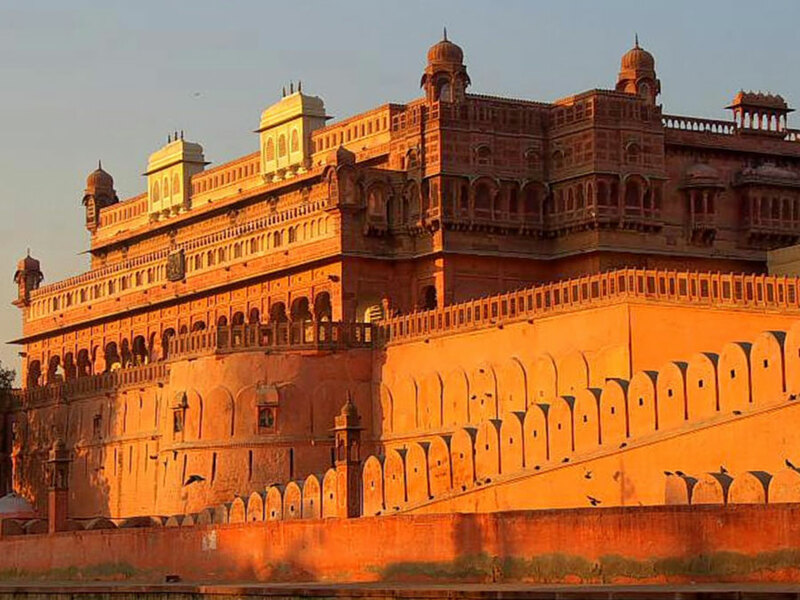 On reaching Agra, visit the imposing Agra Fort, built of red sandstone and marble is a hilltop citadel with fabulous courtyards, fountains and gates, where Shahjehan imprisoned by his own son Aurangzeb. Thereafter, evening is free to explore this vibrant colourful city and its local markets. Overnight stay at Agra hotel. Early morning visit Incomparable Taj Mahal which is among the seven wonders in the world. Tajmahal, Erected by Shah Jahan in memory of his beloved wife, Queen Mumtaz Mahal. Begun in 1631, 20000 workmen took 22 years to complete it a dream in white marble which lies in perfect proportion to the elegant garden of fountains on the bank of Yamuna. Then on the way to Delhi, visit Sikandara -- the last resting place of the Mughal emperor Akbar. Upon arrival in Delhi, overnight stay at New Delhi hotel. 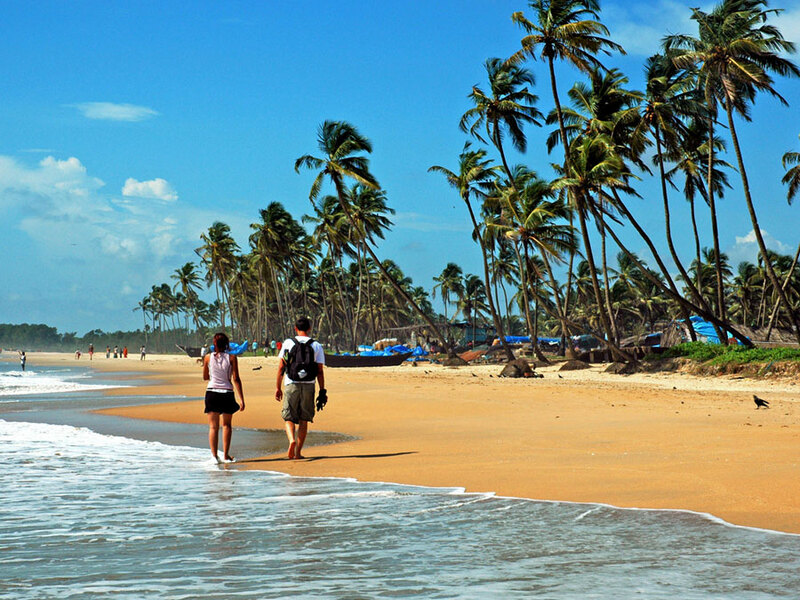 Today you will be transferred to airport to catch flight to Goa, on arrival transfer to hotel. Rest of the day free to relax to beach. In the evening enjoy Goan Carnival Theme -- Join a traditional carnival, which is a part of Goa’s rich Portuguese heritage. Where revelry, song and dance, great food and good wine come together beautifully. Discover the joy of Goan cuisine at a delightful buffet dinner. Overnight to be spent at hotel. Goa: Today you will explore the North Goa & South Goa. In the evening we have for you Fishing village -- Fishing villages are part of Goa’s rich cultural heritage. Local Goan fishing village is created on the grounds of the hotel, forming a perfect backdrop for a charming evening in a very rustic atmosphere. Artisans display their skills whilst the village dancers whirl to the music of a local band. Overnight to be spent at hotel. Goa: This day you are free to relax on Beach. In the evening, enjoy Sea food Bar-be-cue on the beach – Dine under a starlit sky on succulent lobsters, jumbo prawns and other local seafood delicacies which form part of a delightful bar-be-cue set up on a lovely stretch of the Goan beach. Guests may also cook their own food on skewers over a camp fire. A local musician captures the magic of the moment on his guitar strings. Overnight to be spent at hotel. Morning after breakfast drive to airport to board the flight to Delhi or Mumbai. Upon arrival assistance and transferred to International airport 3hrs prior to the scheduled flight time to board your International flight to your home country.